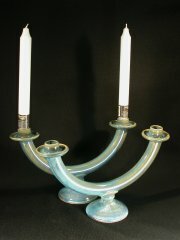 These elegant candelabras are an assemblage of 4 parts, designed to compliment any table setting or mantel. These are made to fit high quality candles, but also fit the lovely flickering battery operated ones. They come without candles so you can choose what type you like. Choose Sea Green, Aqua Blue (seen here), Variegated Brown or Lavender.